BROCKTON — Robert Tinkham, Jr., the current Plympton Health Agent, was in Brockton Superior Court Monday, Jan. 14, with his Plymouth and Brockton-based attorney, John Fink, of Sims & Sims, LLP, fighting to have five of nine counts of a civil lawsuit brought against him for an alleged 20-year fraud dismissed. He also filed a request to dismiss a motion to compel turning over financial documents related to the lawsuit, citing the high cost of making copies. 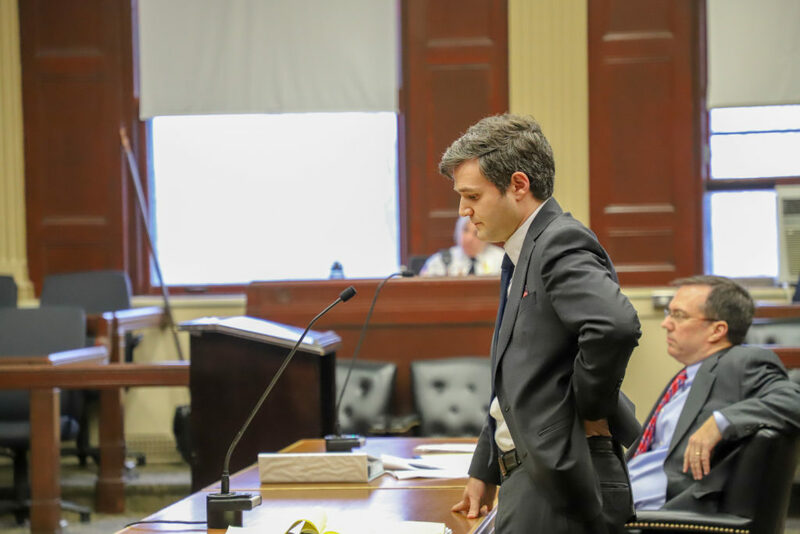 Superior Court Judge Robert Cosgrove, who stood at the elevated dais throughout most of the proceedings and frequently asked questions of the four attorneys present, heard the motions and took them under advisement. Fink’s arguments suggested that the complaint, which had been amended, was not properly filed and failed to state a claim. He also argued that SEMASS, a waste-to-energy recycling company that contracted with the district should have been named as a party in the lawsuit. Lawyers for the district, represented by public sector law firm KP Law, disagreed. The attorneys also disagreed about the manner in which district financial records could be made available to Fink. Fink said he wanted the records delivered to his office as the cost, which he said was in the thousands of dollars for copying the five large “responsive” documents he seeks would be prohibitive to Tinkham. The waste district’s attorneys said they offered to make the documents available to Fink for his review at a public office so that he would not have to have them copied at great expense, something they say they offered as early as Sept. 14, 2018. Cosgrove even hypothetically suggested ordering a copier to be “shipped down” to the public office for Fink’s use, as Fink argued that one wasn’t available for him to use. This did not satisfy Fink. Tinkham, of Carver, is accused of misappropriating $838,458.22 from the Carver, Marion and Wareham Regional Refuse Disposal District along with two alleged co-conspirators, Ray Pickles, the former Executive Director of the district, and his wife Diane Bondi-Pickles, a licensed real-estate agent. Of that amount, the district accuses Tinkham individually of converting over $260,000 for personal use. Tinkham, previously worked as the Carver Health Agent, and, in that capacity, served as Carver’s representative to, and, at times, chairman of the committee overseeing the waste district, according to court records. “Defendant Robert Tinkham, former chairman of the District’s governing committee and duly appointed representative of the Town of Carver, participated in this scheme by conspiring with the other defendants to install co-defendant Ray E. Pickles as the District’s executive director and then by presenting Pickles with numerous fake-claims over many years for payment under the guise of providing landfill inspection and other services. Notwithstanding these claims, Defendant Tinkham did not provide any services to the District and instead he abused his position of trust and confidence to defraud the District, a public entity, of more than $260,000,” court records said. While the matter is currently a civil action in which the waste district is attempting to recover money allegedly defrauded from the taxpayers of Carver, Marion and Wareham, the Massachusetts Office of the Inspector General, an agency which investigates suspected fraud, waste and abuse in the use of public funds and public property is investigating, according to records previously obtained by the Express. The OIG is a non-prosecutorial agency that refers investigations to prosecutorial agencies at the state and federal level. An attorney for Bondi-Pickles, who was not present, also argued a motion against her to dismiss the lawsuit in its entirety at the same hearing. Cosgrove took that motion under advisement, as well.